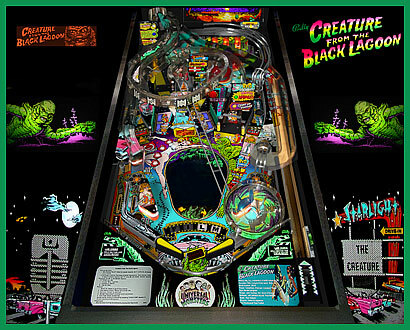 Check out these vintage Bally Creature from the Black Lagoon Pinball Machines for sale. You will also find parts and accessories for current owners including Playfields, Decals, Manuals, Flyers, ramps, 3D promo plastic, and Posters. Start the Movie...Rescue the Girl...get Jackpots and Super Jackpots, lather, rinse, and repeat as Trudeau intended.